There were twenty of them and only one of me. Most had their heads down, grazing on the grass, and had not seen me. Could I get closer to them? I slowly put my bike down on the tarmac, watching them the whole time to make sure I had not disturbed them. Then I tiptoed closer. They still had their heads down. I moved forward some more, trying to avoid snapping twigs. I could not believe that I was this close. They appeared oblivious to my presence. How close could I get? 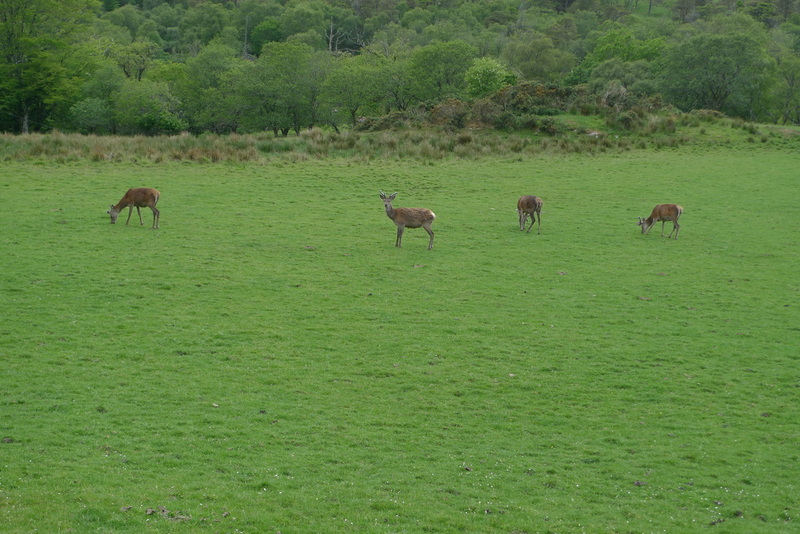 My encounter with Jura’s red deer took me by surprise. I had reached the point of giving up all hope of seeing any because I had cycled almost to the very end of the island. The name Jura means “Island of the Deer” and there are supposed to be 6000 of them, so I thought a sighting was virtually guaranteed, but that was now looking unlikely. I had spent all day on the island without seeing a single one. Until now. It was when the sun was just about to begin dipping and thoughts of turning back for a seafood dinner, a single malt and sweet sleep jumped around inside my mind. I was quite happy to admit defeat, but then I spotted them. Now that the deer had seen me there was no point trying to get closer to them. I was content to sit down and just enjoy looking at them looking at me. There was no other human being around, no passing cars and no noise. Just me and the herd. “almost like stocking up ship for an arctic voyage” George Orwell commenting on his preparations for travelling to Jura where he wrote 1984. Paul and I travelled to Jura on the ferry from Port Askaig, Islay. In the village shop there was a little bit of a queue as Jura-bound commuters stocked up during the final minutes before the ferry departure. “Are the papers not in yet?” a local man asked when paying for his milk and loaf. “No, but there is a Woman and Home Magazine over there,” the assistant offered. The blue ferry, run by Argyll and Bute Council, has space for four cars and an engine that sounds something like an old double-decker bus. The first car to board was driven by the minister, his dog-collar catching my eye as I watched the vehicles make their way down the slipway. We wheeled our bikes onboard; the ramp was raised and so began our journey from Islay to Jura. It only took five minutes to cross the Sound of Islay. Once the cars had driven off and the ferry pulled away we were on our own. The road ahead was empty and it was obvious that we were going to get this all to ourselves. In fact, the number of cars on the road was less than the number of distilleries on Jura (one). The road followed the shore where there is a pebble beach with clumps of seaweed. The pebbles were different sizes, shapes and colours. The smooth ones with their coating of sea water glistened in the sunlight. I could have happily followed this shoreline for the rest of the day, but the road turns inland and starts to climb. We left behind the maritime shades of blue and entered a world dominated by green. Ferns and grasses are only interrupted by brown Heather, grey stone walls of farms and the thin strip of black tarmac. Camas an Staca, a 12 foot tall standing stone is a short trail blaze through tall grasses. The top half of the stone is covered in crusty lichen. I had never before seen such extensive growth like this on a standing stone. It gave the stone a weathered and wise look like a beard on an island fisherman. A little further on the road is suddenly enclosed by trees and their accompanying songbird tenants. It seems strikingly out of character with the moor-like landscape we had just left behind. The trees belong to Jura House which has a Victorian walled garden that was once the top visitor attraction on the island, but is now sadly closed to the public. We reached the sign for the main settlement on Jura, but instead of buildings and people there was a thick forest. I was beginning to doubt that there was anybody living here because all I could see were trees and I remembered reading that only 200 people live on Jura. Then all of a sudden the trees were gone, there were houses, the chimney of the distillery came into view and there was a flying descent towards the sparkling sea. We rolled up by the dazzlingly white Jura distillery. Directly opposite is the equally white Jura Hotel and a little further on Jura Stores also resplendently white. All three establishments proudly display their names in large black capitals. There was no way that anybody would be getting lost in Craighouse. We made our way upstairs where there is a chandelier made from deer antlers and I clutched our room key that was tied to a piece of driftwood with the hotel name carved on it. When I unlocked the door we were immediately drawn to the view of the sea and a chain of tiny uninhabited islands. On one of the beds there was a cushion embroidered with a proud stag and the bathroom had shampoo from Spirited Soaps which contains a subtle amount of Jura whisky. We dropped off our panniers, lightening our bikes for exploring the rest of the island. Leaving Craighouse there is a mix of single story cottages and modern housing facing the water. Tall shoots of grass separated the road from the shoreline and there were some upturned rowing boats. The road twists and turns along the shore and we were cycling alongside a perfect strip of sand. “I’d love to sunbathe there and read a book,” Paul called out. It was very tempting to stop and take advantage of an empty beach and rare Scottish sun, but the rest of the island beckoned. When the road turned inland the landscape got wilder. There is even a strip of grass growing down the middle of the road. Other roads have a white line down the middle, but Jura roads have a green line! A sea of grass speckled white with bog cotton flows to the Paps of Jura which rise sharply to pink conical tops. This was the closest we had gotten to these hills which were always on the horizon during our time on Islay and Jura. It was impossible to escape them and as a result the word pap was becoming a part of my vocabulary, so I thought I better find out what it means. It is an Old Norse word for breast, used because this is what the shape of the hills looked like to the Vikings. There is a section of road that climbs up into thick forest with glimpses of sea. When the road started to descend there were crash barriers and tight twists and turns that made for exhilarating cycling using liberal application of brakes. We plunged out of the forest to face an inlet which is totally green apart from the black and grey rocky shoreline and three white cottages. The road leveled out and we rolled to a stop at another lichen decorated standing stone at Tarbert. At this point I decided I wanted to keep going and Paul’s thoughts turned to heading back to that beach and engrossing himself in a book. I was on a quest to find Jura’s deer and whilst there was still road to cycle I was going to keep searching. It was a lonely landscape of hilly, featureless grassland. I could easily clear my head because there was not much to look at. I found it easy to shut out all the stressful things in my life and my focus was completely on pushing one peddle down after the other . It was the perfect escapism that cycling can provide. Perhaps Jura is a place that is easy to empty your head of cares and worries and explains why Mary MacCrain lived to the age of 128, in 1856. Her grave is at Kilchianaig, near to where I had my deer encounter. I smiled all the way back to the Jura Hotel. I would never forget my encounter with the deer and now I had this road of dreamy golden sunlight to myself. I felt like I was gliding along the moors, through the forests and skimming the coastline as I reached speeds of 25km/h. That evening we sat in the lounge with a glass of Jura single malt whisky and leafed through the back editions of “Jura Jottings”, the island newsletter. I thought about the deer and wondered what they were up to. I imagined them roaming the moors and climbing the Paps. I pictured them grazing on a hillside until they scent something approaching and suddenly stop and look up. They turn their heads in unison, become as still as standing stones and stare straight ahead. Jura is reached by ferry from Port Askaig on Islay. The crossing takes five minutes and the sailings are frequent. Islay can be reached by ferry from Kennacraig. To find out how to reach Islay by bicycle, train and ferry read about my journey in Biking and boating to Islay. There is also the Jura Passenger Ferry that travels to Craighouse on Jura from Tayvallich on the west coast of mainland Argyll. This is a summer service only. The crossing takes one hour and the boat can take bicycles, but not vehicles. It is about 25 miles from where the ferry arrives at Feolin to Inverlussa where the road ends on Jura. The main settlement, Craighouse, is 8 miles from the ferry terminal. This is one of the most traffic-free roads I have experienced in Scotland, so it is a joy for cycling. There are quite a few hills and steady climbs, but worth it for the fast and long descents at the other end. In Craighouse there is the Jura Distillery with tours and a shop. You can climb the Paps of Jura which take four to eight hours. There is a standing stone at Tarbert and on the road between Feolin where the ferry arrives and Craighouse. At Inverlussa you can order tea on the beach with a walkie-talkie. Relaxation, reading, walking, wildlife spotting and sunbathing on the beach are all things you should make time for on Jura. Jura Hotel is the only hotel on Jura, located in the island's main settlement, Craighouse. The hotel is directly opposite Jura Distillery. There are different types of rooms, some with and some without en suite facilities. A double room with en suite costs around £90. The rooms are cosy and some have great views out to sea. Soaps with Jura whisky as an ingredient are provided in the bathrooms. Don't worry- the scent is not powerful enough to make you smell of a distillery! Local produce, particularly seafood is served in the restaurant. I enjoyed a fish pie loaded with salmon, haddock and prawns. For bed and breakfast or self-catering options on Jura the Isle of Jura website has helpful listings.